The above figures are taken from UK patent 5803, granted in 1829 to Sir Charles Wheatstone (1802-1875) for "Wind Musical Instruments". The instrument shown became known as the symphonium, although it is not named as such in the patent specification. Wheatstone was one of the first British musical instrument builders to devote himself to free reed instruments, his company manufacturing aeolinas as early as 1828, with the symphonium described as being an improved version of the keyed aeolians that had recently been invented. The symphonium was a small metal box with an oval mouthpiece on the front and buttons on the sides that selected which reeds were to be sounded. The illustration above shows a simple 16 key instrument, covering two diatonic octaves C to C, with an additional low note. 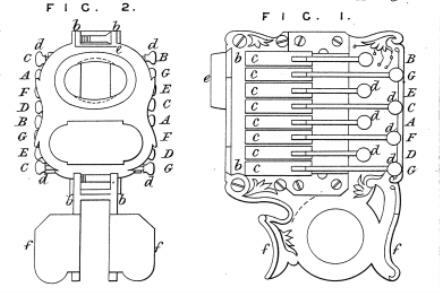 More advanced models were made that added various chromatic tones, then bellows were added to supply the air and thus the instrument evolved into the concertina. ... tongue or spring resembling that of the Æolina, but with this difference, that in the tongue of the Æolina its free end must be slightly raised above the level of the aperture in the metal plate, to fit it for sounding, and it will only sound when the air enters the aperture from that side of the plate on which the spring is placed; whereas in the pipe of the Chinese organ the tubes so influence the action of the tongue that it will not produce the required sound unless the loose end of it be depressed to the level of the aperture, and then its sound may be produced in whatever way the air passes through the aperture. The length of the tube is proportioned to the vibrations of the tongue, and near the tongue a small aperture is made in the tube, which, when open, prevents the pipe or tube from sounding, but on closing it with the finger, and blowing into the pipe, the sound is produced. Wheastone also described the use of bellows to supply air to his modified sheng, but to the best of my knowledge, there are no surviving examples of these instruments. As for the symphonium, only around 200 of them were made and Wheatstone soon devoted all of his energy to the production of the concertina.